BioWare won't commit to a Mass Effect MMO quite yet, but the studio isn't saying it won't happen, either. 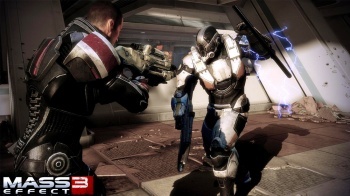 Over the past few years, many BioWare fans have been loudly clamoring for a Mass Effect MMO. At the moment, that's just not going to happen. BioWare's got its hands full with Mass Effect 3, The Old Republic, and Wrath of Heroes. However, the developer isn't completely discounting the possibility of such a game in the future. [Zeschuk]: "I think once The Old Republic is done, we'll take a fresh look at the market. And we'll have learned a lot. While making it, you learn an enormous amount. It's one of the nice things about having these properties in our back pocket... If we want to use something we own as a source for a game, it's easy to do. So yeah, you never know. We've got this giant product to launch, but once that's done we'll consider next steps." [Muzyka]: "We're focused very much on The Old Republic, Mass Effect 3 and Wrath of Heroes, and all the other things we've announced, and haven't announced, but we also have the opportunity to look at our franchises in a way we haven't ever before. There are lots of new platforms and lots of new business models." That last comment by Muzyka is especially interesting, thanks to the comment about unannounced titles. If a Mass Effect MMO does turn out to be in the cards, will you be picking it up?